These photographs, shot between 1988 and 1992 in Grapevine Branch (a small community in West Virginia) were made collaboratively. Not wanting to rehearse the old narrative of “poor isolated rednecks,” Susan Lipper involved her subjects in the storytelling process, visualizing their personal myths. It’s surprising, then, that her work features those familiar tokens—guns, Klan hoods, bibles, booze—that decorate the liberal’s imaginary tableaux of the rural South. How did these props end up there? And, more to the point, what is it that is so unsettling about the results? For a start, we might observe that Lipper’s characters never directly confront the camera. They look at us through masks, or look past us, or blankly stare at the ground. These are postures, and yet their effect is menacing. And it’s precisely that tension—between real and imagined fear—that forces us to engage, not retract. 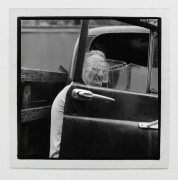 Untitled (Grapevine), 1992, for example, shows an old man looking at us through the broken window of a ramshackle pickup truck. His face and particularly his eyes are hidden by shard patterns. This framing is too perfect to feel circumstantial; it’s practically iconic. Yet the scene’s physical realities—unrepaired window, worn-out clothing—ineluctably evince a lifestyle in decay. Lipper and her subjects are staging the relations between lived reality and its representation. We are invited not so much to look at these photographs as through them, at the social significance of the forlorn rituals they recount. Though Lipper’s scenes are evenly distributed between nighttime and day, they all unfold at a mysterious, timeless twilight hour. Revelation is within reach, but it remains one frame away.